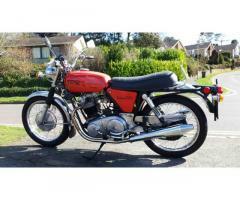 » Model 19 S 1955, 600cc OHV single, matching numbers (price reduced!). 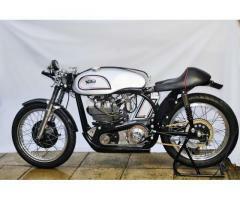 £6800.00 Model 19 S 1955, 600cc OHV single, matching numbers (price reduced!). Mine since 2001 but I've only done 117 miles! Speedo shows 29765. Running, but wise to do minor recommissioning due to lack of use. Fully restored to original condition - believed correct though rivet counters might disagree. Not concours, merely excellent. Bought incomplete and dismantled, except engine and gearbox. Frame powder coated, tank chromed/painted (L Templeton), seat refurbished (Leighton), much chroming and stainless fittings. New parts as required, eg wiring harness, shockers, carb, s/a bushes, steering head bearings, engine sprocket, cables, etc. Peterborough. £6800 (reduced!). Tom123dolby@aol.com 01733 577301. You must be logged in to contact the advertiser.